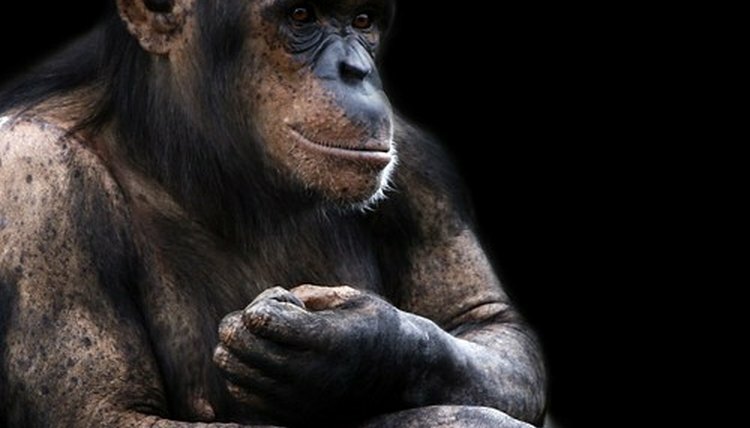 The chimpanzee—man’s closest genetic relative—lives in Western and Central Africa in humid forest, deciduous woodland and mixed savannah. In the wild, chimps have a maximum life span of 60 years. The chimpanzee begins weaning in his third year. By four years of age, the chimpanzee begins walking on his own, but stays close to his mother until he is five to seven years old. Both sexes of chimpanzees reach puberty at about seven. Captive females begin to mate at eight or nine years of age. Females in the wild begin a year or so later, although males are not fully recognized as potential sexual partners until about age 15. Captive females give birth for the first time at 10 to 11 years. Wild females mature three to four years later. Females are able to reproduce until about 40 years old. Adult chimpanzees weigh from 99 pounds to 176 pounds, and stand 3 1/4 to 5 1/2 feet tall. Their diet consists primarily of fruit, leaves, buds and blossoms.